In the digital age, chances are most of us are deskbound at our workstation and get too little movement during the workday. Fitting time to go to the gym in between work and home life could be strenuous with a 9-to-5 routine, but exercise doesn’t always require a gym membership and changing into shorts and sneakers. 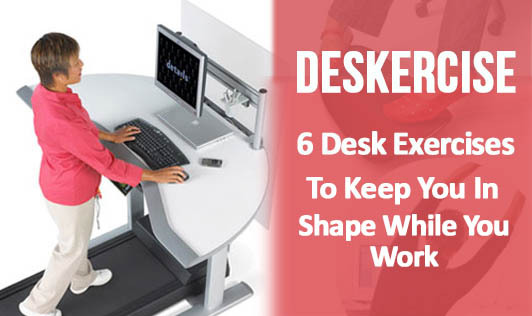 To combat the adverse effects desk jobs have on our weight, back, wrists, eyes, neck, and muscles, and to make the most out of the workplace, these six discreet exercises will keep us active and in shape in between our work deadlines. Sitting in front of the computer screen and frequently moving your neck up and down could cause you to have to an uncomfortable neck strain. While sitting at your desk, grab under the chair with one hand with your shoulder behind your midline. Reach over your head with the other hand and grab the opposite ear. Lean towards the arm that is over your head and stretch your neck.” This stretch can help prevent or reduce stiffness and pain after sitting at your desk all day. Cramped hamstrings could become a catalyst for lower back pain. You can comfortably stretch them, however, from the comfort of your office, along with your thigh muscles. Sitting tall, back off of the back of the chair, engage the abs in and up and straighten one leg forward, thigh muscles gripping the bones. Hold for a 10 count and slowly release. For a good core workout, stabilize the pelvis with the abs and lift both legs and hold. To build more strength, you can do the two-legged version using your arms to help hold the body. Sitting or standing too much can lead to leg and calf pain and have a significant toll on your health. Luckily, you can offset the effects of sitting too much by simply “running” in place from your work desk. In several intervals of 45 seconds of work, followed by 15 seconds of rest, while seated, you can lift your feet up and down as though you were running, and pump your arms at the same time. This will get your heart rate up and even help you burn some calories. To ensure we keep our leg muscles active and toned even while sitting, all it takes is good posture and extending your leg straight out in front of you. Squeeze thigh and lift leg up and down in a slow, controlled manner for 15-20 repetitions, then lift leg up and complete 15-20 quick pulses of very small movement and follow that with a 15-20 second hold at the top. This quick but strengthening exercise will allow desk workers to feel the burn as they repeat this on the other leg. If you’re sitting at your desk for most of the day, your heels will most likely feel achy and tight. To get good blood circulation on the soles of your feet, sit tall, lift your heels off of the floor as high as you can until you are on the balls of your feet. Cass suggests to do this movement slow and complete one set of 20 to 30 repetitions with both legs, and then complete one set of 15 repetitions on one side, and then the other. Heel raises help strengthen the calf muscles. Sitting in front of your computer for hours every day can lead to a great deal of medical problems. Aside from the commonly reported carpal tunnel, pains related to deskbound jobs may travel from the arm to the elbow and shoulder, and the neck and back. The static posture an office chair creates increases stress in the back and can add large amounts of pressure to the back muscles and spinal discs. Sitting tall, back off of the back of the chair, engage the abs in and up, and lengthen through the top of the head as you begin to twist to one side. Turn from the lower back first, then the middle back, then upper back. These six desk exercises will keep you fit and healthy while you work in the office, without having to hit the gym.